"Jenkins X is an open source system that offers software developers continuous integration, automated testing, and continuous delivery, known as CI/CD, in Kubernetes. 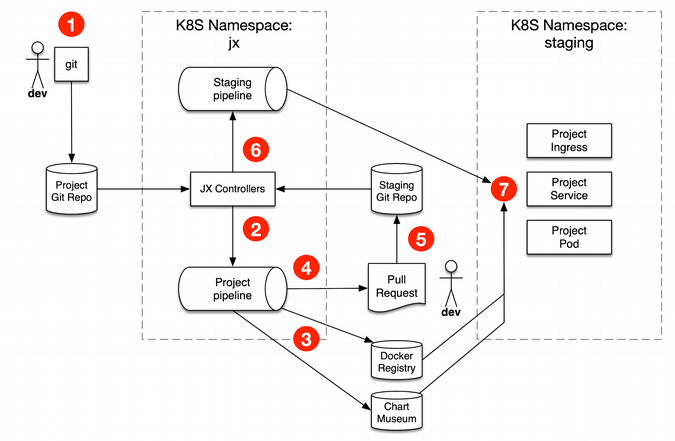 Jenkins X-managed projects get a complete CI/CD process with a Jenkins pipeline that builds and packages project code for deployment to Kubernetes and access to pipelines for promoting projects to staging and production environments." "AWS Outposts bring native AWS services, infrastructure, and operating models to virtually any data center, co-location space, or on-premises facility. You can use the same APIs, the same tools, the same hardware, and the same functionality across on-premises and the cloud to deliver a truly consistent hybrid experience. Outposts can be used to support workloads that need to remain on-premises due to low latency or local data processing needs. AWS Outposts come in two variants: 1) VMware Cloud on AWS Outposts allows you to use the same VMware control plane and APIs you use to run your infrastructure, 2) AWS native variant of AWS Outposts allows you to use the same exact APIs and control plane you use to run in the AWS cloud, but on-premises." No machine learning experience required"
"Amazon Personalize is a machine learning service that makes it easy for developers to create individualized recommendations for customers using their applications." "Amazon Textract is a service that automatically extracts text and data from scanned documents. Amazon Textract goes beyond simple optical character recognition (OCR) to also identify the contents of fields in forms and information stored in tables." "Amazon Elastic Inference allows you to attach low-cost GPU-powered acceleration to Amazon EC2 and Amazon SageMaker instances to reduce the cost of running deep learning inference by up to 75%. Amazon Elastic Inference supports TensorFlow, Apache MXNet, and ONNX models, with more frameworks coming soon." Amazon Elastic Inference supports TensorFlow and Apache MXNet models, with additional frameworks coming soon. 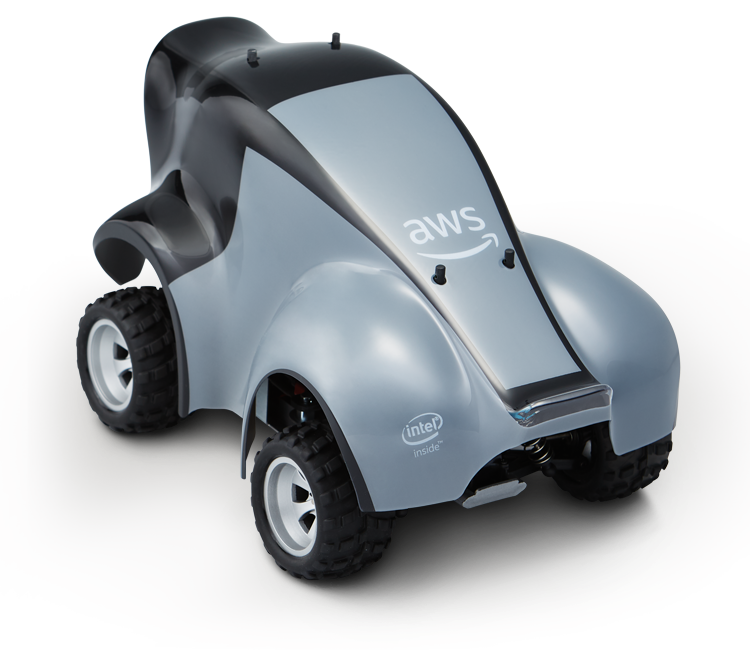 "A tensor processing unit (TPU) is an AI accelerator application-specific integrated circuit (ASIC) developed by Googlespecifically for neural network machine learning"
"AWS DeepRacer is the fastest way to get rolling with machine learning, literally. Get hands-on with a fully autonomous 1/18th scale race car driven by reinforcement learning, 3D racing simulator, and global racing league." "Amazon Managed Blockchain is a fully managed service that makes it easy to create and manage scalable blockchain networks using the popular open source frameworks Hyperledger Fabric and Ethereum*." "Fully managed ledger database that provides a transparent, immutable, and cryptographically verifiable transaction log. Owned by a central trusted authority." "Amazon Timestream is a fast, scalable, fully managed time series database service for IoT and operational applications that makes it easy to store and analyze trillions of events per day at 1/10th the cost of relational databases. Driven by the rise of IoT devices, IT systems, and smart industrial machines, time-series data — data that measures how things change over time — is one of the fastest growing data types. Time-series data has specific characteristics such as typically arriving in time order form, data is append-only, and queries are always over a time interval."